Study commissioned by the EU Parliament identifies risks of TTIP for regulatory freedom of EU in the areas of the environment and food safety. Ecologic Institute and BIO IS were commissioned by the European Parliament to investigate the potential impacts of the Transatlantic Trade and Investment Partnership (TTIP) on the EU’s environmental and food safety policies and the EU’s right to regulate. TTIP is currently being negotiated between the US and the EU. The study provides recommendations regarding the role of the European Parliament in the negotiation of TTIP. The study is available for download. In 2013, US and EU officials have begun negotiations on a free trade agreement dubbed the "Transatlantic Trade and Investment Partnership". If it goes into force, it will encompass nearly half of all global GDP and could play a large role in defining future trade negotiations across the globe. Negotiations will focus on issues such as the harmonisation of rules in various areas (technical standards, intellectual property) and investment protection, among other. The EU’s (leaked) negotiation mandate highlights that TTIP is not to lead to a downward harmonisation of environmental or safety standards or to curb the regulatory freedom of either side. Nonetheless, and on the basis of experiences with trade and investment agreements negotiated in the past, there are concerns, among non-governmental organisations (NGOs) and beyond, that TTIP could do precisely that. Against this background, the purpose of this study is to investigate the potential impact of TTIP on the EU acquis and its right to regulate in the areas of the environment and food safety. In a first section, the study discusses the legal effect of international trade and investment agreements in the EU legal order. The Court of Justice of the European Union (ECJ) has consistently held that international trade and investment agreements only have direct effect within the EU in very limited circumstances. Thus, in past ECJ cases, private companies have not normally been able to rely on e.g. WTO law for invalidating an EU action or claiming damages from the EU. This is likely to apply to TTIP as well. In a second section, the study summarises regulatory differences between the EU and the US in the areas of GMOs, chemicals regulation, treatment of poultry meat and emissions from the aviation sector. Overall, the authors observe a pattern wherein the US have chosen to either not acknowledge risks to the environment and human health recognised by the EU, or to address such risks in ways which markedly differ from the approach chosen in Europe. For instance, the US more often relies on voluntary guidelines rather than mandatory requirements. Investor-state dispute resolution – an environmental risk? Another aspect determining the impact of TTIP once concluded are the dispute resolution mechanisms included in such an agreement. Many bilateral investment treaties contain investor-state dispute resolution (ISDR) provisions. ISDRs establish the right of private actors, typically companies, who believe that a party to an investment agreement has violated the agreement, to bring claims against that party in a judicial forum outside of national courts. In ISDR claims, investors most frequently seek monetary compensation for behaviour by the host state that negatively affected their business, including losses due to changes in government policies. For example, Swedish energy company Vattenfall currently claims several hundred millions Euro in compensation from Germany, based on Germany’s decision to phase-out nuclear energy. If TTIP contains broadly worded investment protection clauses, ISDR could hamper the EU and Member States in efforts to establish regulations seeking to protect their citizens or the environment. In conclusion, the study recognizes that the strongest action that the European Parliament could take to impact TTIP would be to not give its consent to the negotiated agreement, a route it has taken in the past. Additionally, the European Parliament could play a role in increasing public awareness of TTIP negotiations and their impact and could stoke a political debate on relevant topics. The authors recommend that the European Parliament pay very close attention to the precise wording of provisions regarding the environment, food safety, and investments set out in the final text in order to ensure that both parties are able to maintain the environmental and consumer protection standards that they deem necessary and appropriate. Gerstetter, Christiane; Michael Mehling; Andrew Eberle et al. 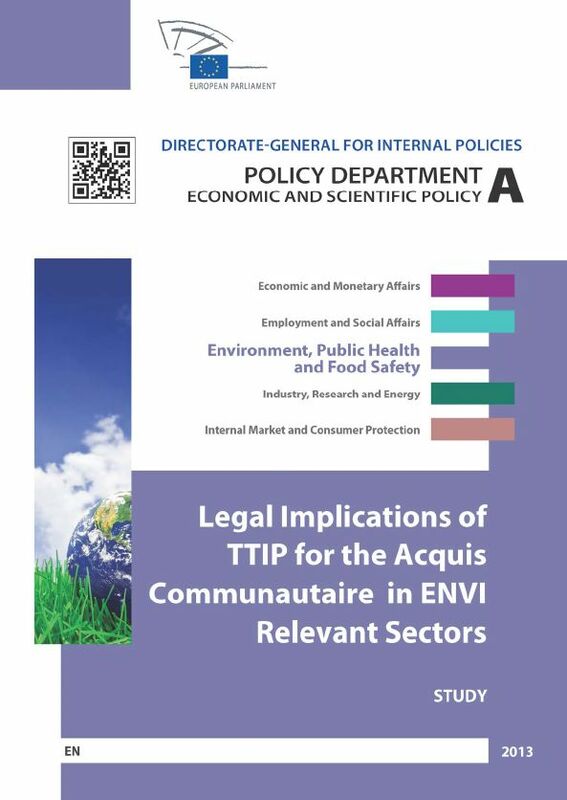 2013: Legal Implications of the EU-US Trade and Investment Partnership (TTIP) for the Acquis Communautaire and the ENVI Relevant Sectors that Could Be Addressed During Negotiations. Investor-state dispute resolution: a risk to the environment?